This Mediterranean Lentil Salad is a light but protein packed cold lentil salad full of Mediterranean flavors and crunchy veggies. A great vegetarian meal! 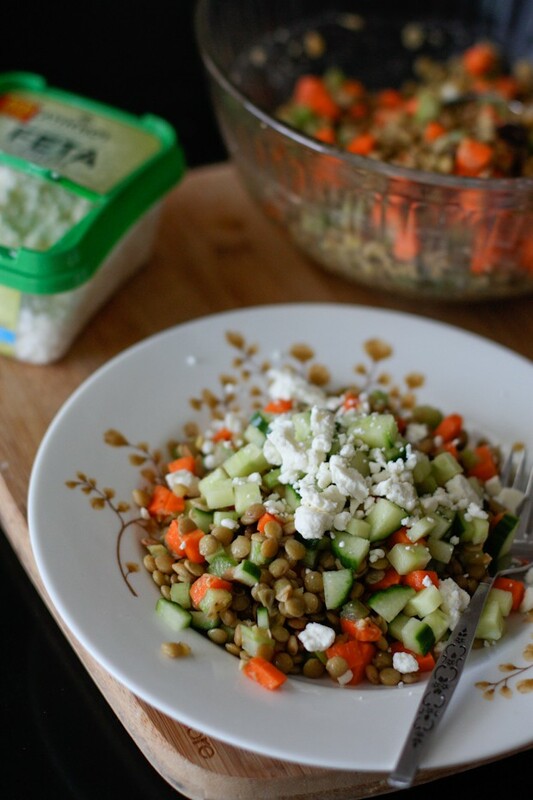 Click here to pin this Mediterranean Lentil Salad recipe! There are certain foods I find myself slightly obsessed with. Any type of food that can be described as mediterranean can easily fall into that category. There’s just something about the simplicity of the food from that part of the world, the flavors that come together with just a few fresh ingredients – well let’s say, that food makes me happy. This simple lentil salad most definitely falls into that category. Unless I’m cooking it at home, I don’t get a mediterranean fix that often as far as restaurants are concerned. I just haven’t found a ton of restaurants in my area (other than a couple favorite Greek restaurants) that serve good hummus, pitas and falafels locally. Maybe I need to look harder. One place I tend to eat at often enough (to get that fix) is at a place in our mall’s food court – of all places, yes I know. They are that place that serves gyros, lavash wraps, hummus, all kinds of fresh tomato and cucumber salads and my favorite falafel. I’m sure most malls have a place like this, but what I love about this one is that it’s run by the same owners, a married couple and sometimes their son, for over 10 years (well at least that’s how long I’ve been going there). Last time I was there, I ordered a falafel pita and had to choose 2 sides to go with it. I usually go for the tomato & cucumber salad and hummus, but this time I spotted something I hadn’t seen before – a simple lentil salad. 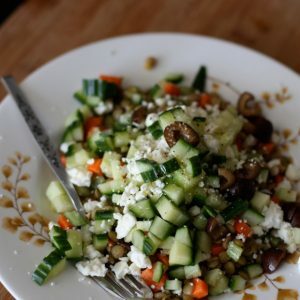 I’ve been pretty much thinking of this simple Mediterranean lentil salad ever since, and with a little consultation from my friend Liz over the phone, I decided it was time to make my own simple lentil salad at home. It’s a wonder I haven’t made this before, I absolutely love lentils but for some reason have stuck with only cooking them up in soups like this Spinach, Tomato and Lentil Soup as well as my family’s traditional Lentil Soup, for as long as I can remember. This is about to change. This salad hits the spot and is so so good for you. With warmer weather coming up, I can guarantee it will be a staple in my fridge for quick lunches or for when I need a protein packed snack. If you crave flavors of the Mediterranean like I do, you may enjoy this Mediterranean Panzanella and Mediterranean Chickpea Salad too. Cook lentils according to directions. I added them into a pot and covered with 3 cups of water and cooked for 10 minutes. I turned off heat and let sit for a few minutes to finish cooking and absorb a little more water. 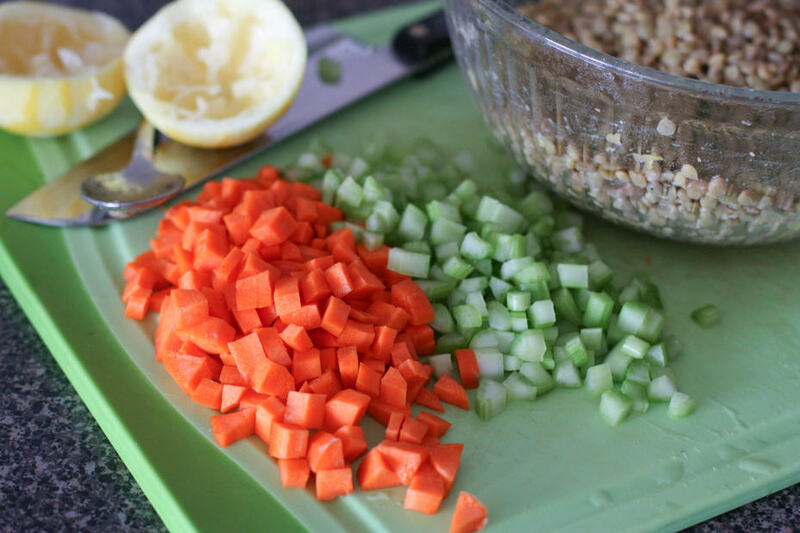 Add your diced vegetables (carrots, celery and olives) to your bowl of lentils and combine. If serving immediately add cucumber and feta cheese. If not serving immediately you may want to add those right before serving. Taste for salt and pepper and enjoy! Aggie this looks great! I’m ashamed to say that I have never tried lentils! I know shocking! I love making lentil salads; this looks great Aggie! Such a nice spring lunch! I love these flavors, Aggie. A simple salad is the perfect lunch for me! I want 50 bowls of this right now!!!!!! This looks so incredible. 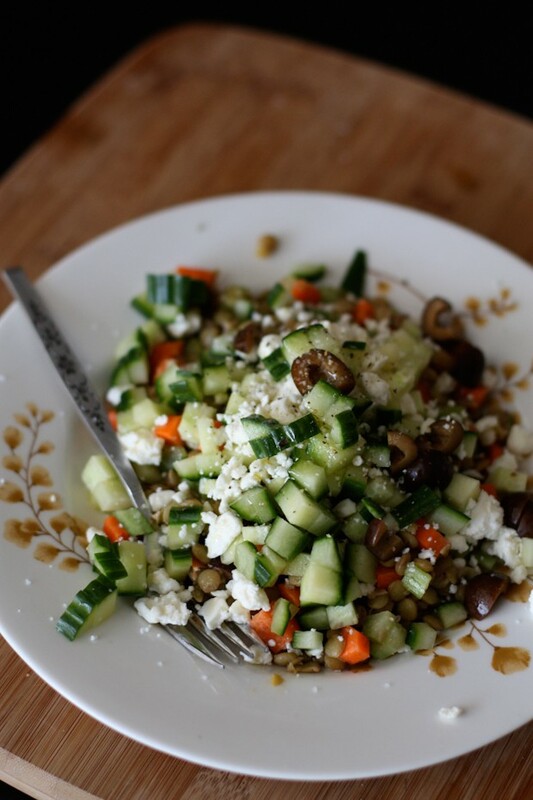 I love the flavors of the Mediterranean as well – what a gorgeous salad! Oh how I love this salad!! I make at least one Mediterranean salad a week. I love the lentils in this. I love anything with lentils! I love this salad. I could live on Mediterranean food forever. I am SO going to make this! I just bought a bag of lentils with no plans on what to do with it. This’ll be perfect. I love Mediterranean flavors, too. I’m completely with you on the “anything mediterranean” as comfort food. This salad looks awesome! This is total comfort food to me. 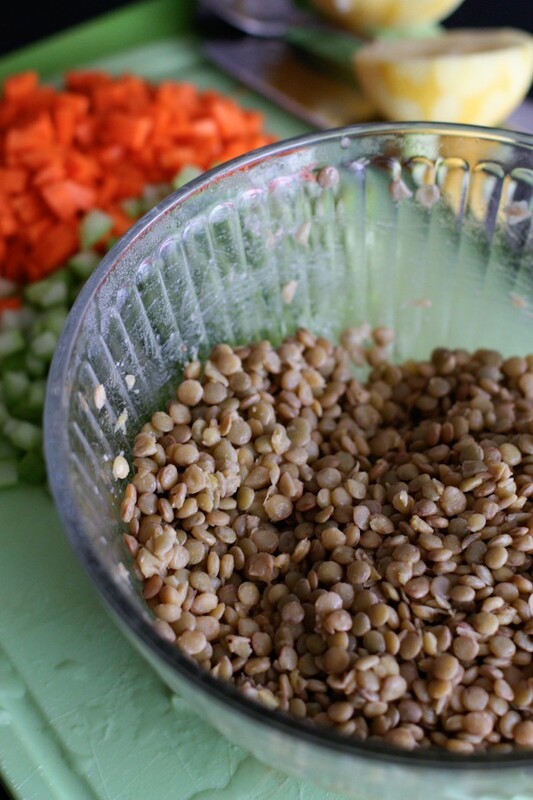 I love a good lentil salad — and yours looks absolutely delightful! I am a sucker for anything with feta! This salad looks delish. I tried to make a lentil soup last week= big fail!!! I will need to try yours instead! This salad looks absolutely amazing, Aggie! Love all those Mediterranean/Greek inspired flavors, especially this time of year. This would be great at my summer BBQs. Thanks! ha we’re on the same wavelength–i made something SO similar last week….except i was wishing i had kalamata olives to add to mine! What a beautiful salad, Aggie! This salad looks wonderful, Aggie! I love lentils (and any other legume) and I love cold salads that you can eat throughout the week. They are also so versatile and adaptable to many other flavors and ingredients, so they can be customized. Bravissima! I love how you finely chopped the veggies. Looks so fresh and delcious! This looks like a great grain-free (not that I care about grains or no grains, just an observation) twist on tabbouli–with benefits. You’ve now inspired me to try a few more twists, using lentils as a base. What a terrific idea! Oh goodness, I love Mediterranean food too, it’s just so delicious 🙂 this dish looks amazing! This looks like a refreshing and delicious meal. We love the combination of fresh and cooked ingredients with cheese to top it off. If you’re not a feta fan, we recommend trying this amazing recipe with Sargento Blue Cheese. The fun taste will only add to this amazing recipe. I omitted the carrots, olives and feta and served it over fried cabbage. I added red bell pepper and a little left over brown rice. It was delicious!!!!! This salad is so yummy, my 8 year old loves it. Most of the time we don’t make the dressing. Thanks so much for the feedback, love that your 8 year old loves it!! That is great to hear! Thank you, happy you enjoyed it! Sounds delicious with salmon! Love lentil salads..really I just love lentils in general. The feta with this looks fabulous! Silly Q – but what kind of lentils did you use? Not silly at all – I used regular lentils you find in the dried bean section, if you have Publix they were actually the store brand. I believe they are brown lentils? I’m in love with feta! And this salad looks awesome. Do you think it could be stored as a prep meal? absolutely! I have eaten this salad a few days in a row. The cucumbers may need to be stored separately in a tupperware with a paper towel if you find that they get soggy after a couple of days. I try to get seedless cucumbers to avoid that. Enjoy! Just made this – terrific! Thanks! Hi Zack! Thanks so much for letting me know, glad you enjoyed it!! I’m a very very picky eater and in the last few years have started expanding my horizons. I decided to try this as something different and it hit the spot. Soooo tasty! that is wonderful!! good for you. I’m happy to hear you enjoyed this, it’s one of my favorites!